At Disney's Hollywood Studios you can now see the newest addition to Disney's cast of Living Characters. Close on the heels of the addition of Remy from Ratatouille (see story here: http://www.onlywdworld.com/2009/04/ratatouille-star-remy-now-appears.html ) coming to life and appearing at Epcot's Les Chefs de France, Luxo Jr., an adorable desk lamp is now appearing at Disney's Hollywood Studios. 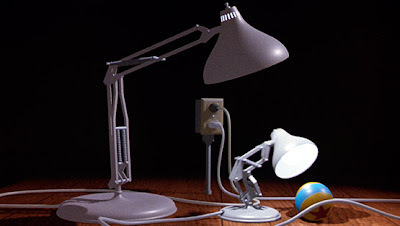 Luxo Jr. is the star of Pixar's first short film, also named Luxo Jr., which was nominated for an Academy Award in 1986. He now appears at Disney's Hollywood Studios in the Pixar Place section on the Lighting Building across from Toy Story Mania. Here is a video clip of the audio animatronic Luxo Jr.'s live performance. The video is from JeffLangeDVD on YouTube in association with http://www.mousesteps.com/. Here is another new experience to add to your list of things to see at Disney World this summer. 0 comments to "Luxo Jr The Adorable Pixar Icon Comes Alive At Disney World"